FIRING LINE SIRES FIRST FOALS! Firing Line, a precocious G1-Juvenile who finished a close second to American Pharoah in the 2015 G1-Kentucky Derby, has sired his first two foals. The first was a colt foaled in Kentucky at Crestwood Farm. He is out of the Petionville mare, Honorville, who was a multiple winning mare that earned $108,040 on the race track. “He’s a nice size, very correct. He is going to be a classy colt!” said Marc McLean. Firing Line was a top class Graded stakes winner and multiple G1-placed earner of $976,000. A precocious two year old, he won a maiden special weight at Del Mar by 4-1/2 lengths, and then ran second by a head to Dortmund in the $500,000 G1-Los Alamitos Futurity. He rolled that form into his three year old year where he was a top Classic contender in 2015. 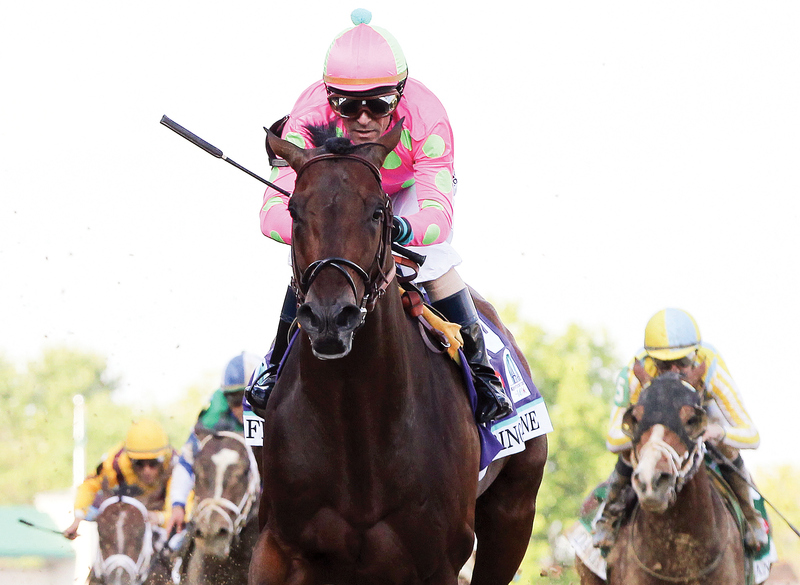 He ran second in the $2,000,000 G1-Kentucky Derby, beaten just a length by Triple Crown winner, American Pharoah. He set a new track record in the $800,000 G3-Sunland Derby, winning by 14-1/4 lengths. During his career he defeated G1-winners: Frosted, Dortmund, Carpe Diem, Keen Ice, etc. Firing Line comes from an active female family, full of Graded winners including; recent G1-Cigar Mile winner Sharp Azteca, along with many other champions, G1-winners, etc. Firing Line retired to Crestwood in 2017 and bred a quality first book of mares. He ranked #1 by CPI and #2 by CI for all first year KY Stallions standing under $10,000 LF with more than 50 bred. Firing Line stands at Crestwood Farm for $5,000 LFSN.